I'm so glad I tried co-washing out again, even if it is in my own way. It has definitely been helping my hair retain more moisture. Every other time I wash my hair, it's a co-wash. It's almost like I've cut my shampoo usage in half, but not exactly. I might co-wash mid-week after an intense workout then a few days later, I use shampoo. Other times, it could be two weeks before I use shampoo again. It really depends on how my hair is feeling to how frequently I "wash" it, but the adding of a conditioner only day every other time has really made a difference. Initially, I started doing this using tension toward the end of my six month stretch. It was pretty helpful so I wanted to keep practicing it. I'm loving it. I've gotten quicker at it. I've done it with tension, without it, and with a brush attachment. All methods have worked well, without the use of heat or causing breakage. AND it cuts down on drying time in a major way. Since I only do my roots, I still end up with sizable hair similar to my beloved air-dried hair. I think this practice is a keeper now. My little sister, a natural head, came to visit for awhile with this conditioner in tow. I've heard a lot about it and she loves it so, of course, I had to try it. I used it twice and my first impressions of it are great. It worked quickly, my hair ate it up and it smells really good. Plus it's cheap so I will be picking up a bottle of my own to try out more thoroughly. In an effort to reduce some manipulation and protect my nape, I started styling my hair in ways I could wear for at least a week. This has been awesome. I've been losing less hair due to breakage and keeping my hands out of my nape. My hair stays moisturized longer and is easy to refresh. Winning! This has also been great for my workouts 3x a week. I don't have to worry about what to do with it during or after, which is an added bonus. Hopefully it's helping me retain some more length at my nape too. Nothing too fancy there, just a few things that have been working well for me. How have your wash days been lately? One more reason for me to purchase the TRESemme naturals conditioner:) Thank you! You hair looks so lovely and thick in the after blow drying photo! I love Tresemme naturals. Your hair looks healthy. Keep up the good work!! Thanks, Nerline! I think I'm going to love it, too. I like this style with the twists! What conditioner/ cleansing conditioner do you use for your co-washes? Thank you Jas! I do not have a specific cleansing conditioner. Probably should try one of those out with all the co-washing I'm doing, huh? I've just been using the conditioners I usually deep condition with - mostly Aubrey Organics GBP, Honeysuckle Rose, and L'Oreal Total Repair Balm. Love your protective style so neat and chic! 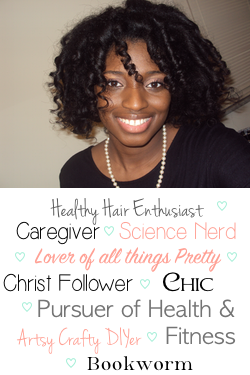 My hair loves all the things you have listed! It is always good to go back to routines that used to be good! Love the thickness of your hair! Yay! I agree - it almost makes you wonder why you gave up on certain things in the first place. Thanks, Yvonne!